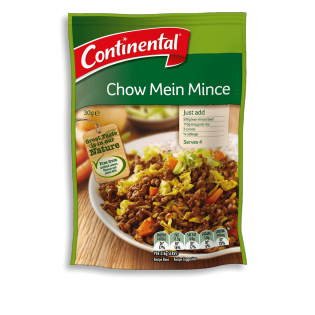 Continental's fast and simple chow mein mince recipe base is blended with authentic Asian flavours. Learn how to create this family favourite dish here. Soy sauce powder (contains wheat), maltodextrin (from wheat), onion powder, natural flavours, sugar, spices, yeast extract, salt, garlic extract, sunflower oil, mineral salt (potassium chloride), food acid (citric). Allergens:Contains soybean and wheat products. Made on equipment that also processes products containing milk, peanut, egg, sesame, fish and crustacea. Just add... 500g lean minced beef 110g long grain rice 2 carrots ¼ cabbage Preparation time: 10 minutes Cooking time: 35 minutes Simply... 1. Heat 2 teaspoons oil in a large frying pan or wok and brown 500g lean minced beef. 2. Add Recipe Base, 1½ cups (375mL) water, ½ cup long grain rice, 2 sliced carrots and 4 cups shredded cabbage; stir to combine. 3. Cover and simmer for 30 minutes or until rice is tender, stirring occasionally. Serve sprinkled with crispy noodles. Here's an idea... Try this dish made with minced chicken or pork instead of beef. The whole family loves the flavours in this dish. I also add veg and sOmetimes noodles for variety. What a great dish! Not only is it easy to prepare and tasty but its great for the wallet too. I get at least 3 meals out of it so its very economiCal. Taste's nice, but you do know the 'Mein' means noddles not rice!